In April 2012, I visited Crescent Junction (pop. 0), and Brendel, Utah (pop. 0). Although the derivation of the name Crescent Junction requires some research, today it designates the intersection of Interstate I-70 (Dinosaur Diamond Highway) and U.S. Highway 191. Although there is no obvious crescent at Crescent Junction, it is the main I-70 exit to Moab, Utah, which lies thirty-one miles to the south. Since my previous visit in 2010, not much has changed in Crescent Junction. The big transformation in “town” since then is a fresh paint job on Papa Joe’s Stop & Go gas station and convenience store. I have never met Papa Joe, but his name appears on the only business at Crescent Junction. Unless someone is living in the back of the gas station, the permanent population of Crescent Junction remains zero. In my 2010 photo of the place, regular gas was a nostalgic $2.95 per gallon. According to another source, in 1946, a service station opened at that site. Based on the architecture of the Stop & Go, it appears that little has changed there except for signage and the price of fuel. By convention, most people assume that Crescent Junction and Brendel are one-in-the-same. Many sources, including some official government documents use Crescent Junction and Brendel interchangeably. In December 2010, I first wrote about this case of conflated identity. Running east and west, and parallel to I-70 at that location is the current Union Pacific Railroad (UPRR) Central Corridor between Grand Junction, Colorado and Ogden, Utah. Once owned by the Denver and Rio Grande Western Railway (D&RGWR), many current maps still identify that now defunct railroad as owning the tracks. Without its long association with the railroad, the nearby place called Brendel would have disappeared into history. In 2010, I challenged the editors at Wikipedia to do their due diligence and identify Brendel and Crescent Junction as two different places. The Wikipedia 2012 entry for Crescent Junction uses the phrase “or Brendel” to identify the place. In Wikipedia, there is no separate entry for Brendel, itself. Wikipedia now indicates that Brendel appears on most railroad maps and that Crescent Junction appears on most highway maps. However, a Wikipedia reader might assume that both places are indeed the same. Geographically, Brendel can be difficult to pin down. Wikipedia says that “Brendel is the name of the rail siding and junction at the same location” as Crescent Junction. Different mapping authorities place Brendel in slightly different places, none of which physically overlaps with Crescent Junction. Both Bing.com Maps and MapQuest.com places Brendel where the UPRR Potash Branch line crosses the Old Cisco Highway (Frontage Road). Google Maps places "Brendel, Thompson, Grand, UT" on what they call “Railroad Road”, about two hundred feet north of the UPRR Central Corridor. In my DeLorme Utah Atlas, that same road is designated Floy Canyon Road. MapQuest.com erroneously calls the road "Foy Canyon" and Google Maps designates only the first hundred yards of Floy Canyon Road as “Railroad Road”, which seems dubious, at best. In the early days, the railroads gave names only to landmarks or facilities that had something to do with railroad operations. In the D&RGWR route maps dating from 1899 to 1904, only “Little Grand” and “Solitude” stood between Thompson Springs and Green River. A 1930 route map deleted Little Grand and Solitude, replacing them with “Crescent” and “Floy”. From other sources, we know that the former construction camp of Little Grand later became Floy (Floy Station). Solitude, as it has in so many places, disappeared completely from later maps. Prior to 1930, U.S. Highway 50 followed a more southerly, crescent shaped route between Green River and Thompson Springs. Around 1930, realignment of U.S. 50 relocated the Moab turn-off farther north, at the current Crescent Junction. With the disappearance of Valley City, the longer route through there was no longer necessary. Although that crescent shaped route disappeared, the new intersection received the name, Crescent Junction. According to a 1990 book of Utah place names, "the name comes from the crescent-shaped configuration of the Book Cliffs near the junction". Also in 1930, D&RGWR mapmakers put “Crescent” on an updated railroad route map. The main function of railroad route maps was to help passengers identify whistle stops and stations. With the advent of Crescent Junction, it was logical for the railroad to use “Crescent” for its whistle stop near there. The 1930 D&RGWR route map is the latest one published on the internet. After that, I do not know what happened to the railroad’s “Crescent” designation. The town of Crescent, Utah (near Salt Lake City), had appeared in a 1908 national directory of railroad stations. To avoid confusion between identical place names, it is likely that the D&RGWR later dropped the “Crescent” in Grand County, Utah. Perhaps it was then that the railroad designated the place as Brendel. A 1940 U.S. Department of the Interior book lists “Brendel (Crescent), D. & R. G. W. R. R.” at an elevation of 4908 feet. A 1964 Interstate Commerce Commission Report indicates that the Texas-Zinc Minerals Corporation planned to ship copper ore concentrates in bulk from Mexican Hat to “Brendel, Utah, the railhead at or near Crescent Junction, Utah”. Apparently, Texas-Zinc prevailed, since a railroad spur still stands near the consensus location for Brendel, Utah. From the scant documentary evidence above, we see that Crescent Junction was not an official place name until about 1930. By 1940, we see Brendel having its own place name, but with reference made to “Crescent”. By 1964, we see the clear distinction between Brendel, as the railhead and Crescent Junction as the highway intersection. With its “at or near” designation for Brendel, even the Interstate Commerce Commission equivocated. Who was Brendel? In all of my research about this, I found no historical reference to any such person in twentieth century Utah. The person or circumstances that inspired “Brendel” as the place name for this lonely railroad spur remain unknown. Unless someone can bring the mysterious “Brendel” into the light, that place shall remain an historical footnote to Crescent Junction. If any reader knows who Brendel was, please comment below or send an email. I would be happy to set the record straight, giving Brendel a firmer place in Utah history. On November 2, 2012, a local resident of Crescent Junction helped me set the record straight. If you get to Crescent in April, my story is that Brendel is NOT north and east of Crescent Junction, but north and a bit WEST. If you walk the railroad track and look at the tiny silver buildings from the track side you will find one named Brendel where the rail crosses a large wash. I will verify this next chance I get. Crescent is in our blood. 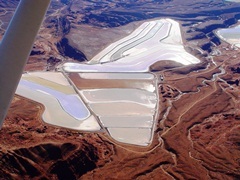 Near Moab, Utah, the Intrepid Potash Cane Creek Facility overlooks the Colorado River. With its in-situ mine and settling ponds resting so close to the river, I wondered about safety. If the earthen dams that impound so much brine were to fail, what environmental damage might ensue? In August 2009, I began writing about potash production near Moab and later regarding newly planned mines near Holbrook, Arizona. With over two hundred thirty-five articles on this website, I am always happy to see a reader comment on my work. Before publishing, I always research my articles to the best of my ability. Even so, I enjoy constructive criticism and do my best to correct errors in fact. By putting my name on every article, I put my own integrity on the line every day. It was with a spirit of enthusiasm that I read a comment by one “Moab Native” regarding my August 21, 2009 article titled, “A Place Called Potash”. Although I did not agree with everything Moab Native wrote, until his final sentence I was encouraged by his thoughts. In his parting words, Moab Native elected to call me “ignorant”. Here are “Moab Native’s” comments, typos and all, followed by my responses to his supposed “facts”. Moab Jim – According to the Encyclopedia Britannica, the definition of potash is “Various potassium compounds, chiefly crude potassium carbonate”. According to Wikipedia, “potash refers to potassium compounds and potassium-bearing materials, the most common being potassium chloride (KCl).” I cannot say which website is correct, but these two authoritative sources disagree on the chemical formula for potash. Moab Jim – According to the “Industrial Products” page on the Intrepid Potash website, the company sells eleven different industrial products. How many of these come from the Cane Creek Facility is not mentioned. On the Moab, Utah page of the same website, the only product listed is “Muriate of Potash”, an archaic or technical reference to potassium chloride (KCL). According to the same webpage, “The potash and salt are then dried, sorted, and processed into various agricultural, feed, and industrial products”. Moab Native – Also, the reason the facility is categorized as low risk, is that NaCl and KCl are naturally occuring minerals in the Colorado river watershed. Moab Jim – According the Salt Lake Tribune article titled, “Dam Safety in Utah”, the Moab Salt (now Intrepid Potash) Stockpile Dam has a “hazard level” of “significant”. That dam has a height of seventy feet, can retain up to 1200-acre-feet of brine and drains an area of three square miles. The safety rating of any facility is only as strong as its weakest link. Since the predecessors to Intrepid Potash completed the Stockpile Dam prior to the requirement for environmental impact statements (EIS), no one knows if local precipitation could fill, overtop or breach the stockpile dam. Moab Jim – If the “Monkey Wrench Gang” were to ride again, breaching of some or all the retention ponds would be possible. Moab Native claims that even a catastrophic failure of all the dams would produce "negligible impact" on the Colorado River. In his comment, he produces no evidence to back his assertion. Moab Native – In the more likely case of a single breach, the cause woud be excess precepitation. The precipitation would act to dissolve the KCl and NaCl to bring the event to a null introduction to the river. Also, to a common sense viewer, it can be seen that the ponds depths do not exceed 6". Moab Jim – Moab Native's assumption that only precipitation could cause a single dam breach is disingenuous. If sabotage could breach all of the dams, could it not breach one or two? Without a cleansing rainstorm to help neutralize the salts, concentrated brine could easily reach the river. The Salt Lake City Tribune article shows retention dam heights of twelve feet. The Intrepid Potash website mentions that “400 acres of shallow evaporation ponds”, but gives no depths. I consider myself a “common sense viewer”, but only someone with access to the retention ponds would know that each twelve-foot high dam retains only six inches of brine. Moab Jim – "Never" is a long time. When popular Wall Arch collapsed in August 2008, no one could say why. The USGS database shows that there is a 1.062% chance of a 5.0 or greater magnitude earthquake within 50 kilometers of Moab, Utah within the next 50 years. The largest recorded earthquake within 100 miles of Moab was a 5.3 magnitude e3vent in 1988. Even if Moab Native’s theory of "plastic flow" is correct, an earthquake originating outside of the immediate area could still affect the facility. Although excess precipitation or sabotage is more likely than an earthquake, there is no EIS to tell us what the various dams could withstand. Moab Native – Regarding state inspection: inspections are conducted on a regular basis by the state. This includes runoff water testing and inspection of all the liquid holding earthen damns. Moab Jim – The state may be conducting inspections of the ongoing operations at the Cane Creek Facility, but that does not mean that the facility is benign. Since the current retention ponds went into operation in 1970, they were and are exempt from ongoing environmental scrutiny. In the event of a future disaster, Intrepid Potash would surely use the “Moab Native” defense. I can hear them saying, “We did everything that we were required to do by law. If the dams broke, it was an Act of God” The term, “Act of God” is an insurance industry invention. It means, “We are not responsible for this disaster, God is”. Moab Jim – Ignorance is a state of being uninformed (lack of knowledge). If any one of us has knowledge that others may require, it is our duty to share that knowledge. Having learned several new facts from Moab Native, I thank him and share his thoughts here. I agree that ignorance is not bliss. However, denigrating and denying the research and reporting of others can lead to a self-imposed, ignorant form of bliss known as self-righteousness. Regardless of whether any dams at Potash break or not, a drive through the Cane Creek Facility is an environmental revelation. In recent years, Intrepid Potash has taken many environmental shortcuts, including uncontrolled flooding from the in-situ mining sites to their retention ponds. The only life that can survive in such a degraded environment is bacteria. Just because it is technically legal to inundate natural creek beds within the facility does not make it right. If state or federal regulators conducted an independent EIS at the Cane Creek Facility today, major changes in environmental management would surely be required. Having attended each 24-HOM since 2008, I was disappointed that the race might not go on. I was such a strong supporter of this family race event that I had developed my own Moab24Live.com website. Each year, I wrote several blog articles here and then archived them at Moab24Live.com. In 2011, I broadcast a live webcam from the event for the full twenty-four hours. Via the internet, I wanted others to see and feel what it is like to attend, or perhaps compete in a twenty-four hour human-powered race. After the October 2011 announcement, I put the 2012 race out of my mind, thus allowing the universe to find a way. The next day, Laird Knight emailed back, "It's been a tough year but I'm feeling better and better about my decision to move ahead with the 24-Hours of Moab. The ground swell of support has been heart-warming. This event has become an integral part of the culture of mountain bike communities throughout the Rocky Mountain region. Kids that raced as juniors back in the mid-nineties now have kids of their own coming to the 24-Minutes of Moab kids’ race. For many of the "old-codgers" of my generation, being ready for the 24-Hours of Moab continues to be a source of inspiration and motivation… to keep riding and stay healthy and fit. But when it's all said and done, it's just about having fun, and enjoying some fine time with your friends and family." I could not say it better, Laird, so I will not even try. In the past, the 24-Hours of Moab has received a fair, and maybe an unfair share of criticism for its environmental impact at Behind the Rocks. Critics charge that some racers have gone off course, damaging environmentally sensitive areas. From the articles and pictures I have seen, critics accuse a lot, but offer very little demonstrable evidence of supposed environmental damage. To be sure, there are some photos available of bicycle tracks that deviate from the course. Still, there is not one posted image of a 24-Moab racer making those tracks. During the 360-days each year when there is no bike race at Behind the Rocks, the place reverts to its cow pasture origins. During 98.6% of each year, cattle, off-road vehicles (ORV), bicyclists, hikers and equestrians traverse and sometimes trash the area. During night racing, a few cyclists may deviate inadvertently from the established line. However, these are dedicated racers, not Kamikaze pilots looking to wipe out as much cryptobiotic soil as possible. A few wheel tracks in the softer soil may be evident, yet that impact is insignificant when compared to local potash mining or uncontrolled ORV usage on BLM and SITLA trust lands. As Laird Knight told me, “On a mountain bike it never benefits you to cut the course and trade the highly efficient, low rolling resistance "line" that is on-course for the deep sand that you would encounter off course. I have never seen any evidence of intentional off-course travel. We do educate folks about the importance of cryptobiotic soils and of staying on course. As for the venue itself, what I see every year, for the last seventeen years, is practically the same as what I saw the first time I visited the site. On the subject of environmental impact at Behind the Rocks, I believe it is time for the environmental critics of this relatively low-impact, family event to come out and see for themselves. It is all too easy to sit in a faraway office and study other people’s documentation or photos. It is quite different to experience a great race powered only by the human body and spirit. On the racecourse itself, other than human breath, there are no emitted hydrocarbons. Again, compare the low environmental impact of this bike race to any motorized gathering in Moab. As I told Laird Knight, I am an environmentalist and write often about environmental issues. This race and its culture of low-impact, family fun are too good to lose. Thank you Laird Knight and Granny Gear Productions for accepting the financial risk and once more allowing us the thrill of a classic Moab Live race event. In May 2011, I drove Hwy 191 North to Canyonlands Field, which serves as both the commercial and private aviation airport for the City of Moab, Utah. It was a clear, windless and warm day at the airport. My friends Tiger Keogh and Terry Carlson, both of whom work at the airport, had invited me out to watch the flight action on that busy Saturday. Soon after I arrived, the Great Lakes Airlines plane from Denver, Colorado landed, followed quickly by several charter aircraft. Although the commercial traffic was interesting, voices in the sky kept interrupting my photographic work. Since the land around Canyonlands Field contains so many ancient spiritual sites, for a moment I felt those spirits calling down to me. Looking up, I saw a series of skydivers contrasted by a thin overcast of clouds. Wheeling around in the breeze, their hoots and hollers reverberated across the quiet airfield. Out past the Redtail Aviation hanger, where we share our MoabAirlines.com webcam, I saw beyond to the Moab Skydiving Epicenter. 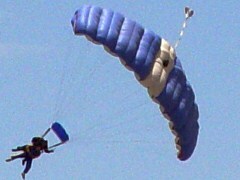 There, two separate businesses, Skydive Canyonlands and Skydive Moab offer tandem parachute jumps for novices and first-timers. With shouts of joy and abandon coming from all over the sky, I captured the scene using both live video and still images. To do that required juggling my Sony Bloggie Touch for the HD video with my ancient Sony DSC-F717 digital camera for the stills. As soon as I arrived, a small Cessna loaded with parachutists taxied around the corner and took off. Soon, I could hear the plane circling above, but the bright sun masked my view. Until we heard shouts from above, no one below knew that jumpers were in the air. Looking up, I soon caught sight of several first-timers preparing to land. Friends were hooting from below, which set off more hollers from above. One exuberant jumper ran all the way from the landing zone to the staging area. As tears of joy streamed down her face, “It was freaking awesome,” she declared to her friends. 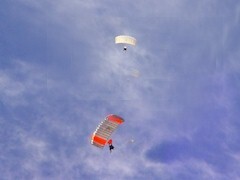 Indeed, it was awesome to see humans descending from a blue and white sky desert sky. The image of mythic humans descending from above conjured my own visions Moab Rockart, which often features the spirit of the ancients floating in the air.